When it comes to leaky loos, FIX-A-LOO has the answers to solve all cistern maintenance problems. 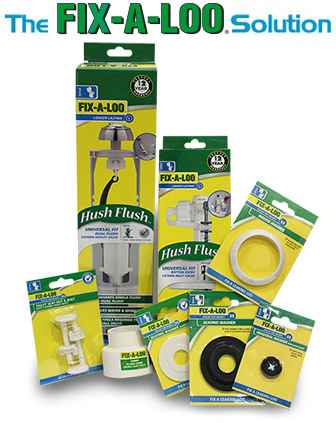 We supply all common cistern washers, seals, cistern inlet and outlet valves, repair kits cistern buttons, flush pipe cones and numerous parts for toilet models up to 30 years old. for ease of use, all products contain installation instructions and handy hints to assist in leak repair. The following pages identify many FIX-A-LOO products to solve the most common water wastage problems. We also feature a number of our top selling cistern valve products.